The 2018 Design awards are now closed. Please attend the awards event at the 2018 SEGD Conference: Experience Minneapolis and see the website for the winners on the 10 June. The 2018 SEGD Global Design Awards FINAL Deadline: entries close 03.02.2018. 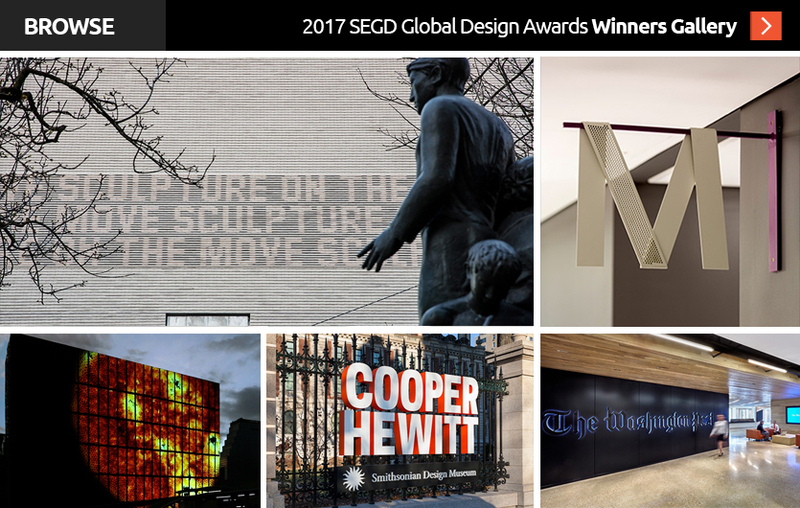 Winning entries will be announced and celebrated at a dedicated SEGD Global Design Awards ceremony at the SEGD Conference Experience Minneapolis.Look at the 2017 Winners galleryas a reference point for what to enter. Since 1987, the SEGD Global Design Awards have set the standard of excellence for experiential graphic design—honoring design work that connects people to place by providing direction, content, and compelling experiences in public spaces. Winning projects have ranged from interactive multimedia environments to complex hospital wayfinding systems and from branded corporate environments to museum exhibitions. Retail and interior projects, architectural signing, public art, design research, and books have also won awards. Students compete along with professionals and often win Merit and Honor awards. The prestigious Best of Show award shines a spotlight on the winner brighter than any other SEGD accolade. Have questions about the 2018 SEGD Global Design Awards? Call or emailJennette Foreman, +1-202-638-5555. Winning, of course, brings validation and acclaim. But it’s not all about the glory. Participating in the 2018 SEGD Global Design Awards also promotes innovation, creativity and excellence—and who doesn’t want to be aligned with that? The design team responsible for the groundbreaking 2017 SEGD Global Design Awards Best of Show award-winning project was led by iart ag Chairman and CEO Valentin Spiess. Here, Valentin shares his process behind selecting the Best of Show winner, elements of a winning project and why you should submit your entries today. There are only two weeks until the January 31 deadline. Here is everything you need to know about the 2018 SEGD Global Design Awards all in one place to ensure that you’re making the most of the time you have left. Christina Lyons is no stranger to the SEGD Global Design Awards. 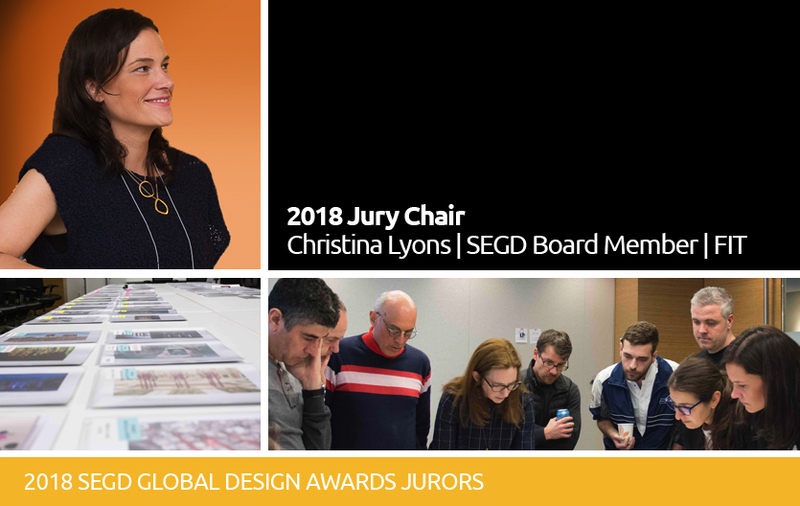 In addition to joining the jury last year, she’s leading an impressive lineup of talented designers on the 2018 SEGD Global Design Awards jury. Curious about why you should enter, what the jurors look for and how to put together a winning entry? Here’s what this jury vet has to say. The 2018 SEGD Global Design Awards encompass seven categories that represent key practice areas of experiential graphic design. To help guide you through the submission process, here are the seven categories with examples of project types and past winners. Entering the 2019 SEGD Global Design Awards may seem daunting, but fear not! Here's a list of the "dos and don'ts" to help you get started and increase your chances of winning. 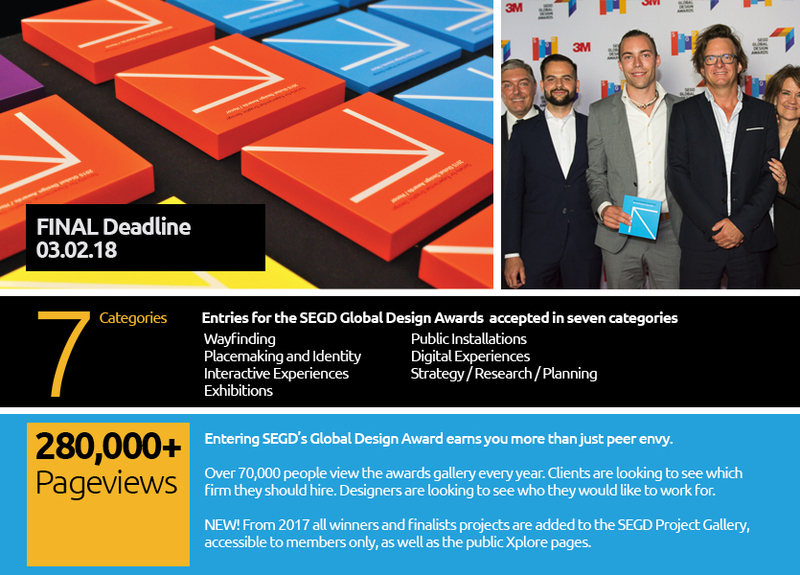 The 2018 SEGD Global Design Awards, the only international awards program focused on user experiences in the built environment, will officially open for entries on December 1, 2017.